The Iraq Al Amir women’s cooperative Association was founded by the Noor Al-Hussein Foundation over two decades ago. It aimed to make the women financially independent and to raise their standard of living by increasing their income and preserving local heritage. Under the umbrella of the NHF the project employed 41 women in the production of hand- made paper, hand-woven fabric, ceramics/clay, and food processing. The NHF then turned to capacity building with an extensive training on finance and admin, quality control, product design, marketing, and donor linkages after the women’s cooperative took complete ownership of their project. The cooperation exists to keep their culture alive, protect the environment, and to provide meaningful employment for local women in the village. The workshop is organized into three domains; handmade paper production, pottery, and a hand weaving mill with three handlooms. In addition, the women at Iraq Al Amir are renowned for their fresh and delicious produce, often catering for visitors and clients. Capacity varies per activity from 5-20, capacity is higher for meals. Paper making: Learn the basics of papermaking using natural, local materials and the traditional techniques of the craftswomen of Iraq al Amir. Paper production in this region uses limited water resources, and can be manipulated by adding vivid colors, textures, and patterns using local plants, herbs, and spices. Participants will experiment with fallen palm leaves, grass, flowers, sumac, red henna, saffron, rose leaves, paprika, tea and local coffee. The paper is tactile, and smells beautifully of the herbs and spices used, evoking the spirit of the charming village of and its people. Children ages 5+ can participate at the discretion of their parents. 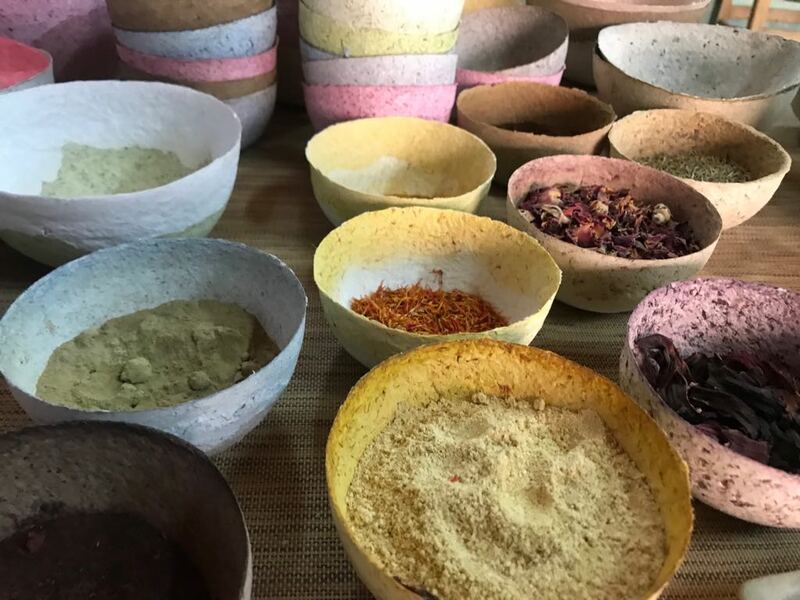 Cooking Class: learn to cook delicious traditional Arabic dishes from the local women of Iraq Al Amir. Choose from a variety of iconic dishes such as musakhan (chicken with onions and sumac) and magloubet Zahra (‘upside down’ rice and chicken with cauliflower), or make a special request. Children ages 10+ can participate.  Located in a village outside of Amman where poverty is high and employment is low. Unemployment for women is around 33% in urban areas and is even higher in rural areas. As the cooperative is managed and run by members of the society it has created many job opportunities for women of all ages. There are currently 12 women on a fixed salary and a higher number who work on commission. They also have provided training for more than 150 women from surrounding villages on weaving, paper making, and ceramics. The cooperative also strives to give back to their community as they have developed a “knowledge station,” which provides the community with services including printing, photocopying, internet access, and computer courses. The computer courses include ICDL, comprehensive, and typing. The handi-craft village was created to preserve the cultural heritage of the region with the aim of encouraging tourism and increasing the economic benefits of the community. 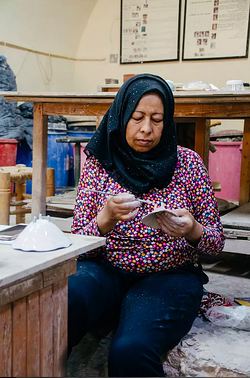 They operate by providing necessary materials and training and make it clear that all the local women need to succeed is commitment and motivation, Yusra is one such woman. Yusra has been involved in the cooperative since the very beginning when the Noor Hussein Foundation first established it. She was a part of the original group of women who were trained in weaving, paper, and ceramics. An international trainer came in to train the women on weaving and at the same time trained a small team of women to become trainers. Yusra undertook this course and now continues what she learned by conducting trainings herself. She has seen the growth of the cooperative as well as a change in ownership from the Noor Hussein Foundation to the women’s cooperative themselves. In an area where women as sole providers is nearly unheard of, Yusra has used her added income to buy a car and even her own house. Yusra has broken with tradition and remains unmarried by choice, she considers the women in the cooperative to be her family. Thanks to the cooperative Yursa and her colleagues have a bigger role within their communities, women come to them to learn and they help bring in funds for other people in the area.